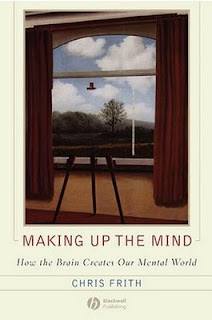 Chris Frith is a professor of neuropsychology with the Wellcome Trust Centre for Neuroimaging at University College London, and his book Making Up the Mind: How the Brain Creates Our Mental World explores the the relationship between our physical brains and how we experience the world around us. Among other things, Frith provides a neurological answer to a question almost every child has asked and most adults (including yours truly) continue to wonder about: Why we can't tickle ourselves? The reason, Frith writes, "lies in prediction." He explains that our brains dull our awareness of the many times a day when we touch our own bodies, but focus sharply on contact with other people. For example, when you sit at a desk and twiddle your fingers, your brain knows all about it ahead of time and your conscious mind largely tunes it out. But if someone else takes hold of your hand, your brain is surprised and you become acutely aware. Frith writes, "If I start stroking your hand while you are having your brain scanned, then I can observe a dramatic increase of neural activity...But if you stroke your own palm in just the same way, then I will notice very little increase in activity. When you touch yourself your brain suppresses your response." The upshot: When we tickle ourselves, our brains see what's coming and decide it's no big deal. But when other people tickle us, our brain is surprised and responds, triggering a strong physical reaction. Interestingly, though, there is an exception to this: Schizophrenia sufferers who experience a "delusion of control" — a belief that someone else is moving their limbs — can in fact tickle themselves. "Those who tickle themselves may laugh when they please." "One has to be careful what one takes when one goes away forever." Joanna Moorhead, a contributor to the UK paper the Guardian, discovered over dinner one night that her cousin Leonora Carrington was the most famous living surrealist artist in Mexico. She set out to find her and film her story. The touching and enlightening result is here on the Guardian's website. Although I love art and make a habit of seeking out women artists, Leonora Carrington is new to me. Despite the fact that one of her first major shows was in New York at the Pierre Matisse gallery in 1947, she is barely represented in New York's major museums — the Museum of Modern Art apparently has four of her pieces in its collection, but they don't seem to be on view; the Metropolitan Museum of Art has a similarly skimpy collection, and where it is, I cannot say. 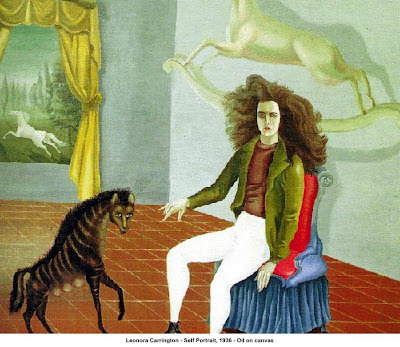 Leonora Carrington was born in England to wealth and status, but didn't fit in. 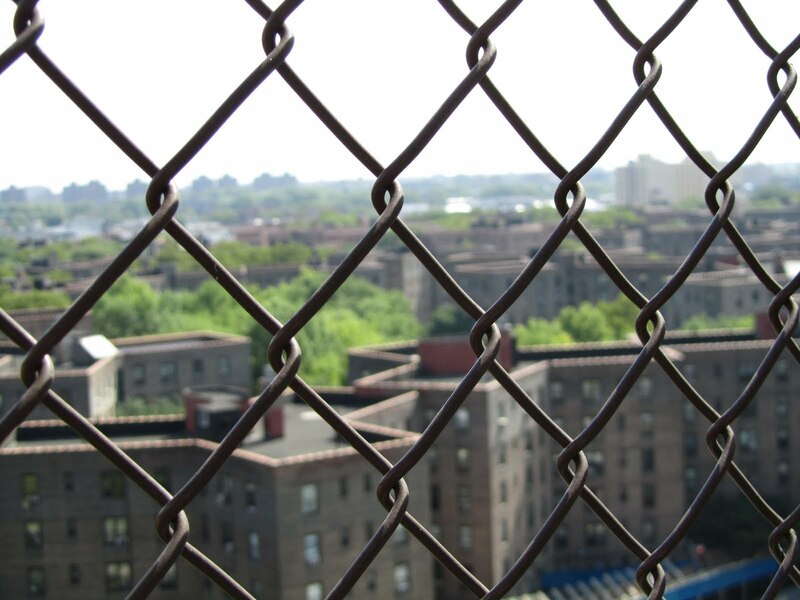 Her story is studded with heartbreak; interrupted by a mental breakdown and subsequent institutionalization and treatment with a now-banned drug; and propelled by a sense of adventure and a need to create. I find her powerful words and mysterious art tremendously moving. When, in the video interview, Joanna Moorhead attempts to elicit a narrative explanation for her cousin's work, the artist fiercely and repeatedly resists intellectualizing; she insists her paintings are purely visual. Yet this painting, "Grandmother Moorehead's Aromatic Kitchen," takes on a certain poignance when you hear Joanna Moorhead describe the way her grandmother underestimated Leonora Carrington, dismissing her as an "artist's model." Leonora Carrington is also the author of a novel, The Hearing Trumpet. Written in 2004, when the author was 84, it's the story of a 92-year-old woman who receives a hearing trumpet as a gift — and learns that her family wants to have her institutionalized. 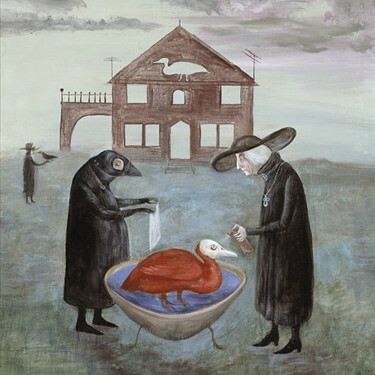 I'll leave you with one more image, the painting she named "Bird Bath," and this link to an online mother lode of Leonora Carrington's work. Behold what we've been missing. Saturday, July 24, 2010, is New York's third annual City of Water Day, when local boaters converge on Governors Island, Liberty Island, Brooklyn Bridge Park and Atlantic Basin to celebrate our island city and the waters that surround it. I discovered this while walking by the LIC Community Boathouse. The joint was a-jumpin'; kayakers were double-checking their gear and readying their boats before entering Anable Basin and beginning their journey. This is Paul, a contractor from Sacramento who's here for the summer. 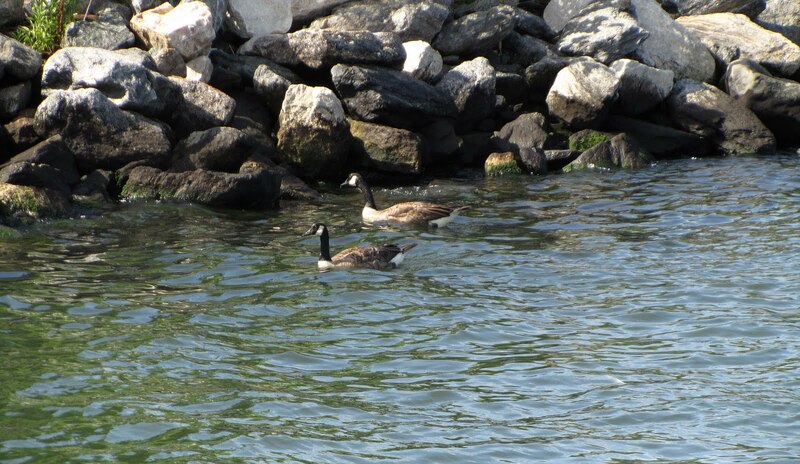 He told me their destination was Governors Island, where he and many others would be camping out overnight. When I arrived at the dock around 9 a.m., a rowboat was loading up and getting ready to leave. 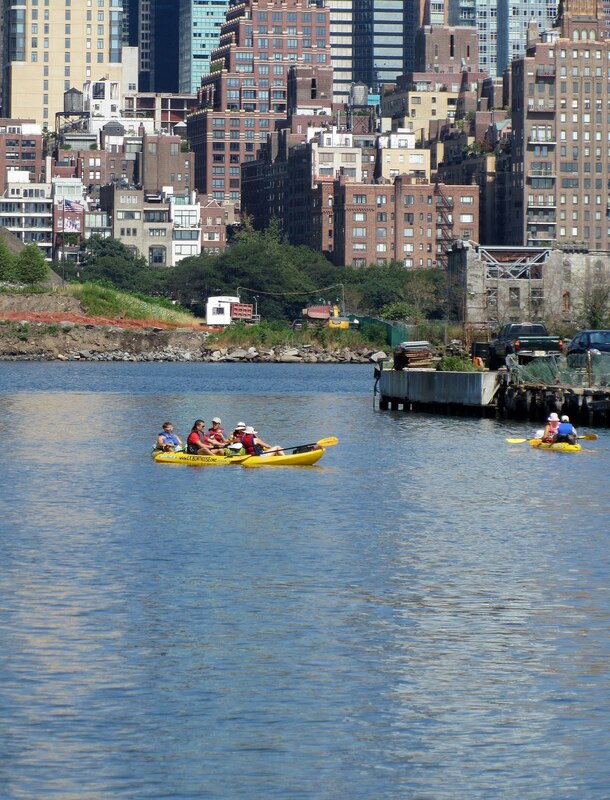 Ten minutes later, the crew was merrily rowing along the East River. 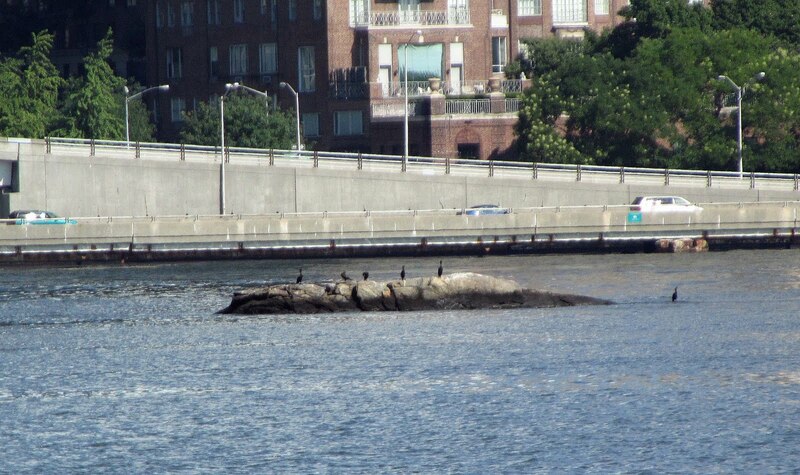 ...the cormorants were lined up for a ring-side view. 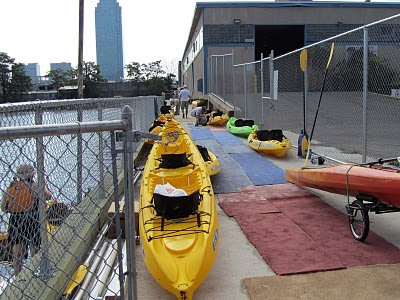 By the time I finished my walk, the LIC Community Boathouse was empty and the last few kayakers were getting ready to begin their day on the water. 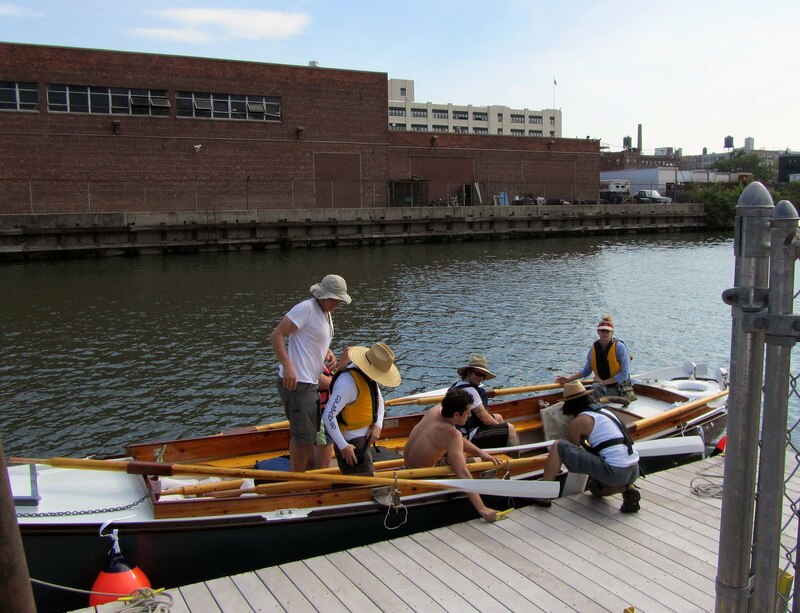 One boater told me the trip to Governors Island could take as little as an hour, but added that he would be stretching it to at least two hours — the point is to be out on the water. 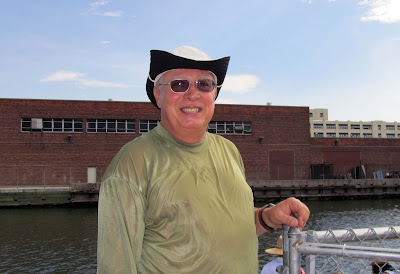 Another kayaker, who seemed to be in charge, invited me to join them for a mid-week trip. I may just have to do that. Matisse Alone: "Creativity takes courage." "I don't paint things. I only paint the difference between things." 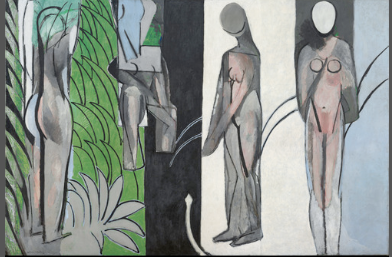 New York's Museum of Modern Art has a new exhibition, Matisse: Radical Invention, 1913–1917. As I wandered through it on Friday, I thought about the many days I've spent with Matisse and MoMA in the past. 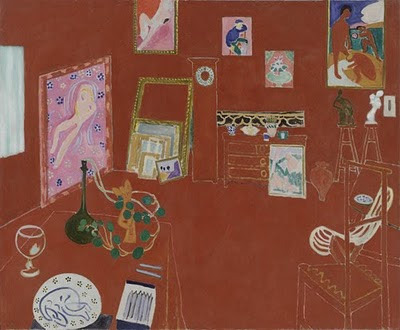 Henri Matisse won my heart the moment I saw "The Red Studio," which is part of MoMA's permanent collection. I was about 14, visiting the old museum for the first time, and I suddenly had the feeling that I'd never really seen before. The huge painting seemed to reach out and surround me, pulling me into its center. Matisse said about this painting, "Where I got the color red — to be sure, I just don't know. I find that all these things . . . only become what they are to me when I see them together with the color red." My next Matisse revelation was a MoMA special exhibition — I think it was in the 1970s — devoted to his paper cut-outs. I didn't expect to like it, but as I walked in and through and under his abstract, air-infused creations, I was enthralled. He was a very old man when he made these, and I picture him lying in bed or sitting in a chair, holding his paper up to the light and then carefully cutting away the shapes he wanted to see. Light was important to him. He once said, "A picture must possess a real power to generate light and for a long time now I've been conscious of expressing myself through light or rather in light." In 2003, when the new MoMA building was under construction and the collection was temporarily housed in a warehouse in Queens, the museum brought us "Matisse Picasso," a show produced in collaboration with London's Tate Modern and two French museums, the Réunion des musées nationaux/Musée Picasso and Musée national d’art moderne/Centre Georges Pompidou. The show theoretically explored the relationship between the two artists, but in reality it was a sort of Matisse-Picasso shoot-out that invited people to compare and choose the superior artist. But of course, the deck was stacked. What 20th century artist could ever measure up to Picasso's fire and talent and originality? So it was a relief to find Matisse on his own again at MoMA in the new exhibition. The focus is a period when the artist relentlessly explored technique and form and media, developing the visual vocabulary he would build on throughout his career. His experiments, his discoveries, his frustrations and joys are right on the canvas. During much of this period, he explores the idea of "becoming" — the transition between the now and the next. 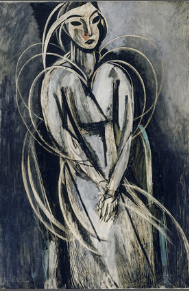 The curator's remarks about this painting, "Portrait of Yvonne Landsberg," describe the way he expanded her out into the air by surrounding her with arcs — a decision he apparently made at the last minute. Matisse reworked this painting, "The Blue Window," several times, starting with a more naturalistic image and gradually reducing and simplifying it to achieve this tranquil, seemingly effortless effect. The painting that moved me the most is this one, "Bathers by a River." The audio remarks quote Matisse as saying this was one of the "five most pivotal works" of his career. 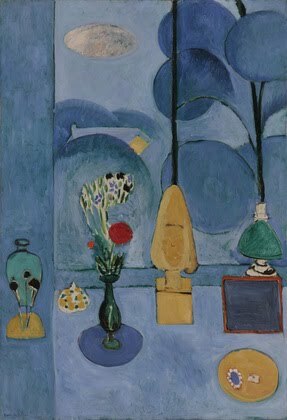 Matisse worked and reworked this painting, just for himself, off and on from 1909 until 1917. The exhibition includes x-ray images and photos of the work at earlier stages, and as you look at them you can almost feel the artist's mind working. It's an extraordinary sensation. If you are in New York between July 18 and October 11, be sure to visit this exhibition (you can buy your tickets online here.) If you won't be in the city, then find a quiet hour and treat yourself to the multimedia show on the MoMA website. "Walks. The body advances, while the mind flutters around it like a bird." 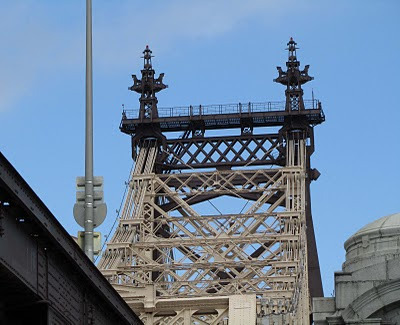 The Queensboro Bridge is a fine place for a walk on a Sunday morning, when cars are fewer and fresh air has a fighting chance against exhaust fumes. The sidewalk leading to the Queens-side approach is paved with cobblestones. Virtually all of the surrounding streets were this way at one time. Even twenty years ago, cobblestones and a network of train and trolley tracks made local travel bumpy. We also have trolley tracks to thank for what is now the bridge's pedestrian and bike path. 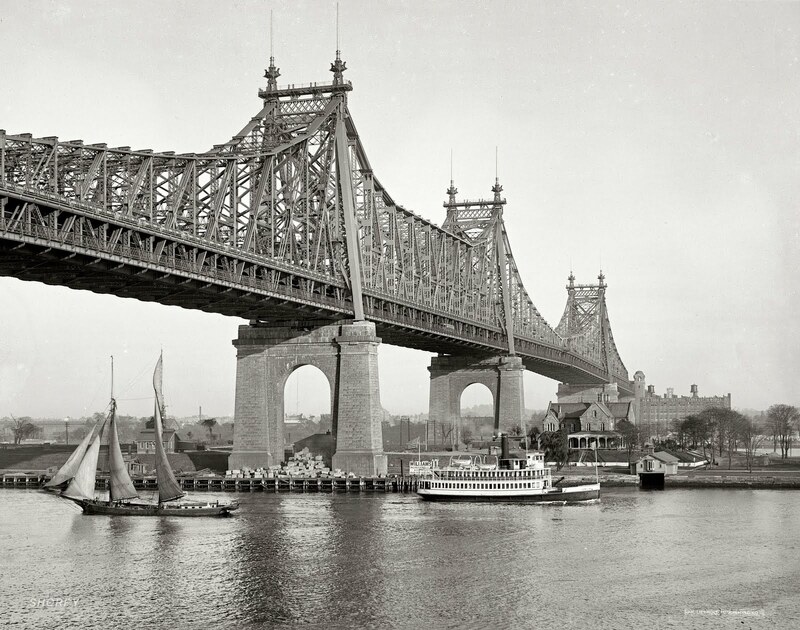 When the Queensboro Bridge was first built, pedestrians, trains and cars shared the upper roadway. On the north and south sides of the bridge's lower roadway, trolleys ferried people back and forth from Manhattan. 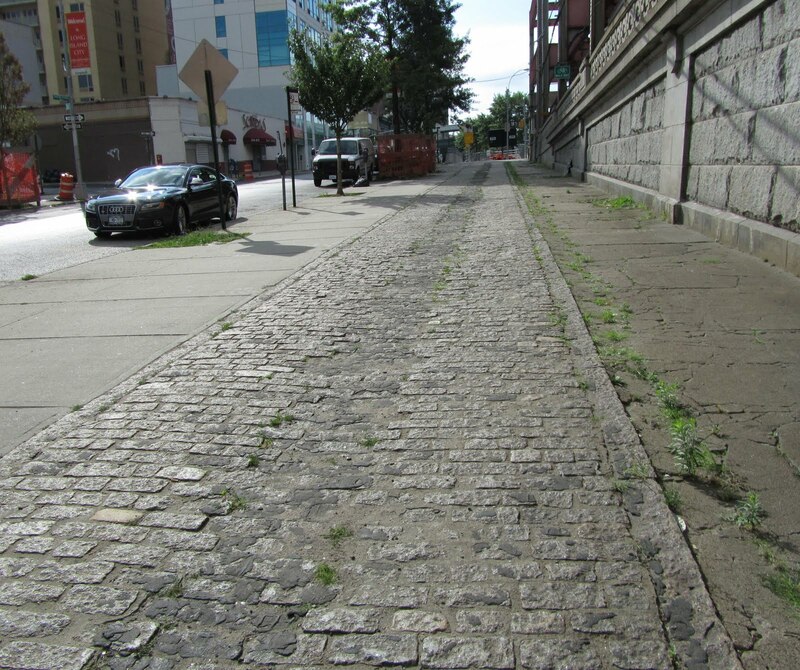 When the auto-mad Robert Moses removed the trolleys in the 1950s, one lane of the lower roadway was set aside for pedestrians and cyclists. For many years, it was the south lane, which offers a glorious view of midtown and lower Manhattan and the lower river bridges (Manhattan and Brooklyn). Today pedestrians and cyclists use the north trolley lane, which provides its own pleasures. The Queensboro is a multispan cantilever bridge designed by Gustav Lindenthal, Leffert Buck and Henry Hornbostel. 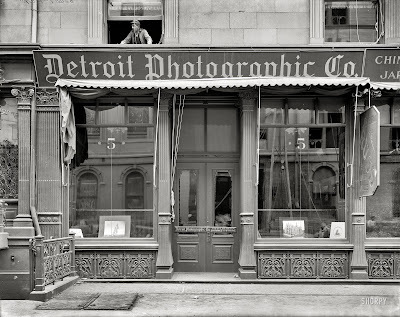 It opened for business in 1909, and the photo above was taken one year later. While the east and west spans total only 2,166 feet, a walk on the bridge is more than twice that — 7,449 feet — due to the long approach on the Queens side. 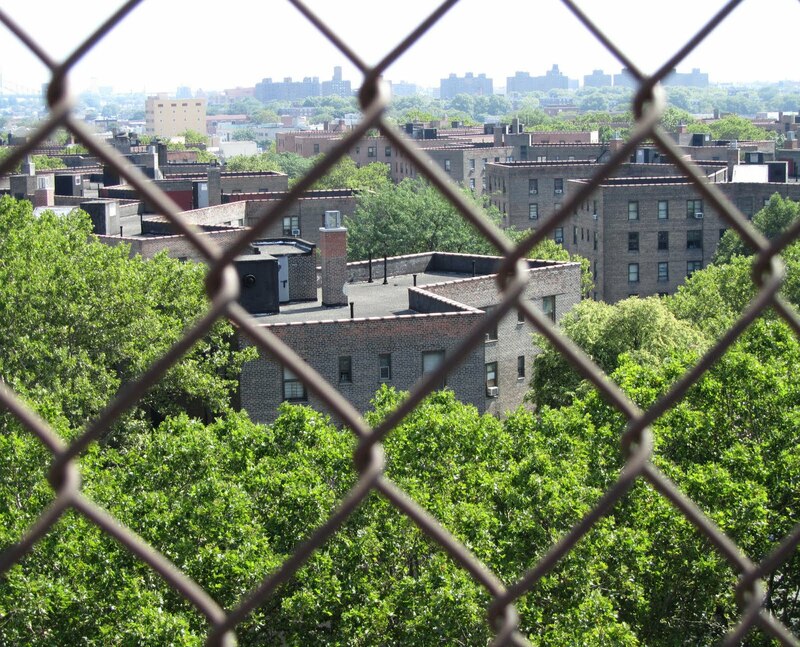 As you look north along that approach, you see the fortress-like tops of the Queensbridge Houses, the largest public housing project in North America. 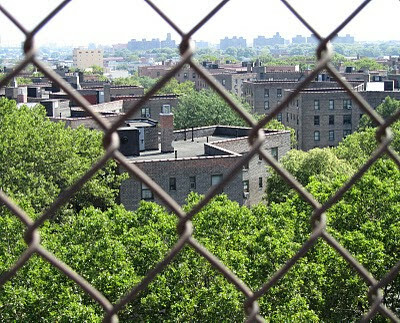 At one time this was a good place to live, later a truly terrible place; it is still not nearly as safe as it should be. 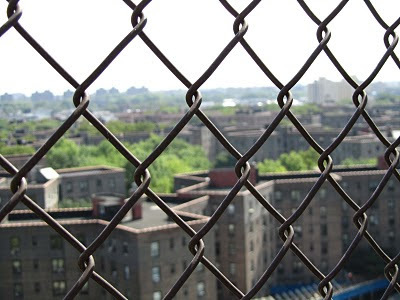 Seeing the houses through "bars" feels a little too appropriate. I'm sure it's how many residents feel about the place they call home. 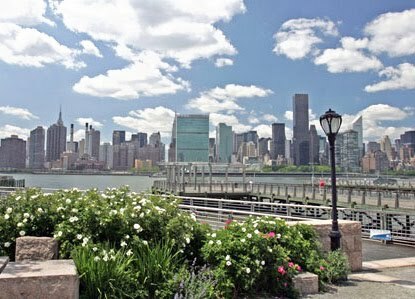 When you're finally out over the water, the view to the north along the East River is bridge after bridge, like nesting dolls. 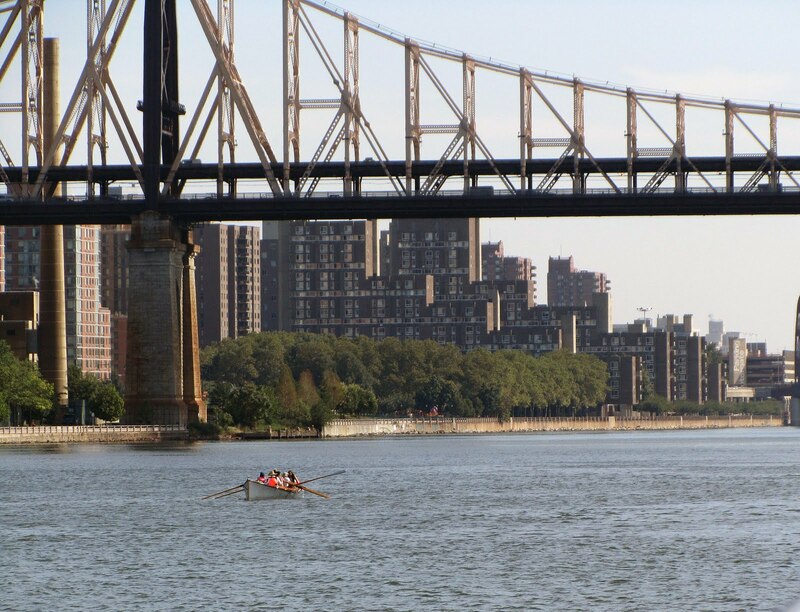 First in view is the squat, movable bridge from Long Island City to Roosevelt Island, which can be raised to permit tall-masted ships to pass. 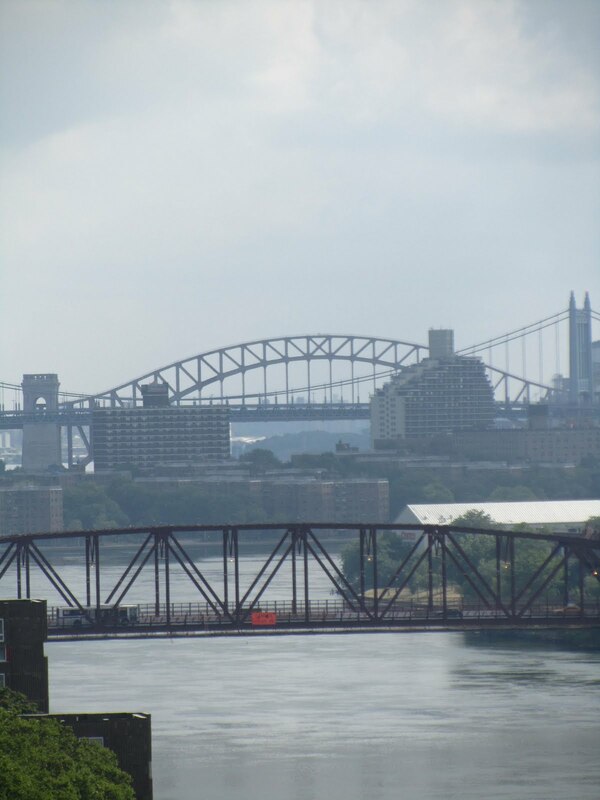 Beyond that are the Robert F. Kennedy bridge (formerly known as the Triboro) and the Hell Gate railroad bridge. Not visible but not far beyond is the Whitestone Bridge that connects the Bronx and Queens. The water below looks peaceful, but that's deceptive. 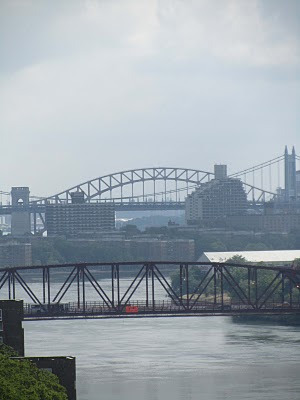 The Hell Gate Bridge got its name from the turbulent waters it crosses, and that turbulence continues downstream. 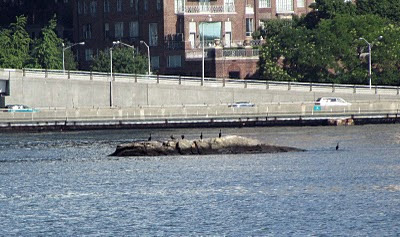 A few years ago a company called Verdant Power had a plan to generate clean energy by installing hundreds of underwater turbines in the East River, but the powerful currents sheared off even the strongest turbine blades. 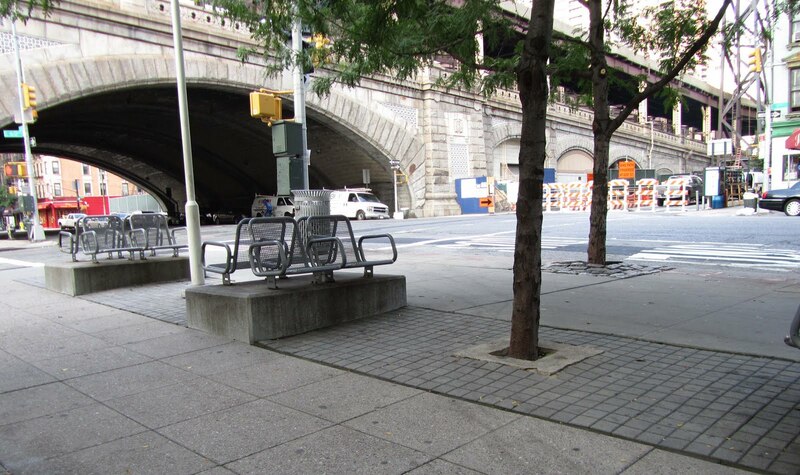 When I reached the Manhattan side, I stopped by the Starbucks at 60th Street and First Avenue and was once again reminded that, thanks to "public space" tax abatements for real estate developers, one can now find a seat in the least likely places. Places like this are daily demonstrations of Kinsella's Law ("If we build it...). This particular bank of benches runs for a full block, from Starbucks to Bed Bath & Beyond, and even on a Sunday morning many seats were filled. Some people come for the coffee or the coffee maker and stay for a rest. Some are homeless men who sleep under the bridge archway at night and spend part of their day here. The benches are also a destination for New Yorkers with walkers; it's not unusual to find half a dozen or more frail folks congregating to rest and chat at the far end of the block. This particular morning about a dozen extremely fit gray-haired folks, plus one young guy in dreadlocks, were organizing a bike ride; they had serious equipment and serious spandex — and they all looked good. On the return trip, I stopped for this shot of the top of the tallest bridge tower, which rises 324 feet above Roosevelt Island. Once upon a time, my husband worked on these bridges and the tippy top was his favorite hangout. There's a treat for those whose timing is just right on the way back to Queens. 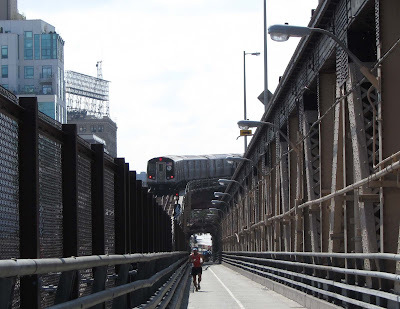 Near the end of the Queens approach, the N subway line swoops from below the river to the elevated tracks that take it to Astoria. A train was on its way there when I passed by this morning. It's much more fun when the train is coming toward you and, for just a moment or two, some eye-brain mix-up makes the bridge feel like a roller coaster. "If you saw a heat wave, would you wave back?" Walking is a muse and a madeleine for me — it stirs up new ideas and old memories. I walk three or four miles almost every day, but some days are easier than others. Yesterday, when I set out for a walk at 10 a.m., the temperature was already in the high 80s. As I walked, the heat was set on broil; it burned down from above and smoldered up from the pavement in a fiery feedback loop. The tar on the street was already beginning to turn gummy. It crossed my mind that on relentlessly sunny days like this, every little pool of shade becomes an oasis. The thought of an oasis led me to a distant memory of another hot day when I was around three years old. I was in a car, transfixed by highway mirages — the sparkling pools of "water" that appear and disappear on the road ahead. "The effect is caused by a thin layer of hot air just above the ground. 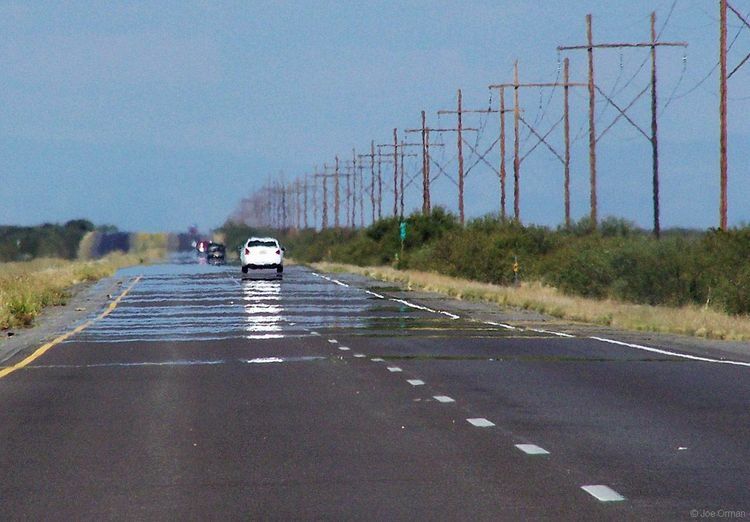 The difference in refractive index between the hot air at the road surface and the denser, cooler air above it causes the boundary to act like a mirror: distant objects are reflected...The 'water' is actually a reflection of the blue sky, but a close look at this image also shows reflections of a car, power poles, bushes, a mile marker, and roadside grass. Because the reflection occurs solely at very shallow angles, the mirage appears only in the distance and continually recedes as one moves towards it." I saw no highway mirages yesterday, but the heat wave isn't done with us yet. I'll keep looking. "Our knowledge is a receding mirage in an expanding desert of ignorance." 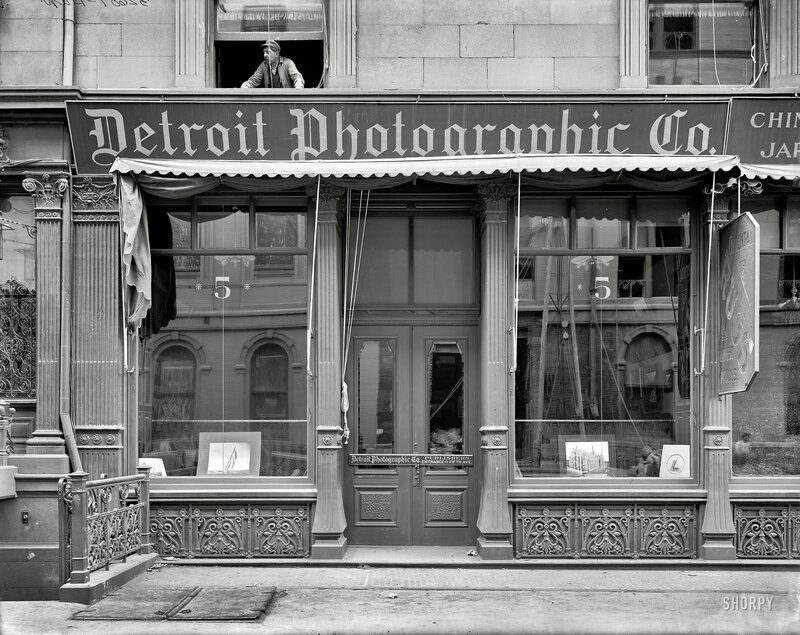 The name of the business is Detroit Photographic Co., but this photo was taken at 218 Fifth Avenue, New York, New York, around 1900. Click here to see it full size and discover the mirages in its reflections. "It is the spectator, and not life, that art really mirrors." "Imaginary gardens with real toads in them." On July 1, the Library of Congress announced the appointment of W.S. Merwin as U.S. Poet Laureate Consultant in Poetry for 2010-2011. Merwin is the country's 17th poet laureate. The first was Joseph Auslander, whose term ran from 1937 to 1941. Others include Robert Penn Warren, Robert Lowell, Elisabeth Bishop, Randall Jarrell, Robert Frost, Gwendolyn Brooks and Rita Dove. Click here to review the full list. Our new poet laureate — whose full name is William Stanley Merwin — was born in New York City in 1927 and raised in New Jersey and Pennsylvania. The biography on the site of the Academy of American Poets notes that, as the son of a Presbyterian minister, Merwin began writing hymns when still a child. It also notes some of the undercurrents of Merwin's work: "Merwin's mother had grown up an orphan, and later lost her brother and her first child; Merwin's father was raised in a hard and violent home. 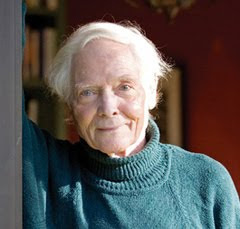 The grief from these tragedies, the inherited violence, and the surrounding poverty, run throughout Merwin's poetry, across a career that spans five decades." Despite his rough beginnings, Merwin won a scholarship to Princeton; there, as he studied poetry with Galway Kinnell and John Berryman, the trajectory of his life began to take shape. In his 60-year writing career, he has won two Pulitzers, a National Book Award and at least one of almost every other literary honor. 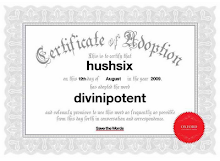 Today he is a devout Buddhist and since 1976 has lived in Hawaii. That's where he met and married his wife, Paula, and spends his spare time working to restore land destroyed by logging and agriculture. Call me superficial, but as I read the accounts of his appointment in various places, this sentence in Patricia Cohen's New York Times profile jumped out at me: "Mr. Merwin...retains traces of the extravagant handsomeness of his youth." It is a rare thing to see a man singled out for great beauty, so of course I had to search for photos of Merwin as a young man. There he is at left, looking for all the world like a romantic hero — perhaps Heathcliff, just back from the Yorkshire moors, ready to sweep Cathy off her feet. And yes, you can still see that beauty in his face at 83. Click here to watch a 2008 interview with Mr. Merwin by Jeffrey Brown, hear him read a poem and see more images of him in his youth on the PBS Newshour's website. Let's end with our new poet laureate's words. The title is "Thanks" and you can read the complete poem here. This final stanza, although first published in 1998 in the collection The Rain in the Trees, might have been written yesterday. "Out of the quarrel with others we make rhetoric; out of the quarrel with ourselves we make poetry."